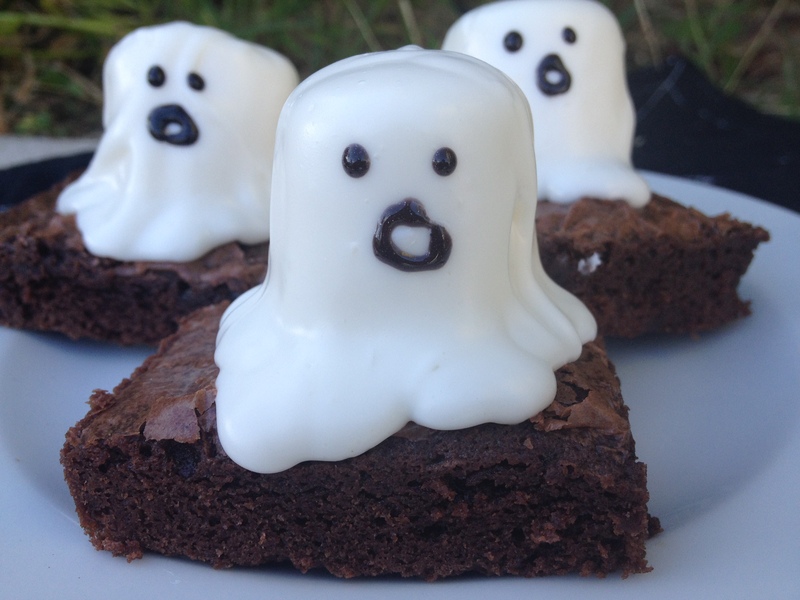 Here is a super fun and easy dessert to make for Halloween! It’s so easy you don’t even really need a recipe. Just make a 9 x 13 pan of your favorite brownies (boxed or homemade it doesn’t matter). Cut them into squares, unless you have a brownie pan like me and then it does that for you (thanks dad I love my brownie pan)! Place a large marshmallow on top of each square. Get a container of vanilla frosting, take the tops off and microwave for 20 seconds. This makes the frosting looser so that you can drizzle it over the marshmallow. Drizzle about a tablespoon of frosting over the marshmallow. Allow frosting to set for about 10 minutes and then with black decorating gel pipe on eyes and mouth. That’s it, nothing fancy. The kids were so excited when I brought these over to dinner the other night. they loved them!